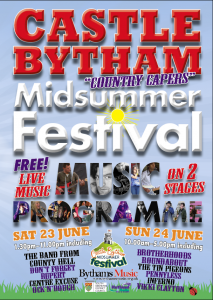 The Castle Bytham Midsummer Festival will be taking place on June 22nd/23rd 2019, but Bythams Music will not be organising the musical and arts activities. After more than 10 years of putting on some great gigs in Castle Bytham and Little Bytham, we have decided to take a break this year as we neither have the staffing, resources nor time to do what we would like to do. If Michael Eavis can take a year’s break at Glastonbury, then there is no reason why we cannot do the same – though on a slightly smaller scale! We realise that this will be a disappointment to the many bands who have played for us in the past and would like to do so again (or, indeed, those who have yet to play for us for the first time). We are also sorry that we are not able to provide for the many hundreds of music lovers who have enjoyed the ambience and atmosphere of our past Festivals. However, all is not lost, as the Castle Bytham Midsummer Festival Committee has decided to put on the music this year, so any band or performer that is interested in playing should contact cbmidsummerfestival@gmail.com in the first instance. Or drop by the Festival Facebook page and leave a message there. Bythams Music plans to be back in action for 2020, so we will keep you all up to date as and when we are putting out our usual “Call for bands”. … so watch this space!!! We present a feast of great music for all tastes – our biggest and best festival line-up yet, with new acts aplenty and some old favourites too. This year, reflecting the Midsummer Festival’s overall ‘Country Capers’ theme, there’s a folky, bluesy, country, rootsy flavour to the weekend’s musical mix. Plus our amazing beer festival, which this year features 24 real ales, 7 lagers and 10 ciders, as well as a prosecco bar and a Pimms tent! The excellent food options include our perennially popular barbecue and the Village Veggie, a recent introduction that has also gone down well with those just looking for an alternative to regular barbie fare. There will also be live music in the village’s two pubs, the village hall and a concert in the church by local choir Village Voices. Further bands and performers are yet to be announced, so watch this space. Acts and timings are still subject to confirmation. Detailed listings will be given on our website and in a souvenir programme available just before the event. We are always looking for folks to come and help us put on the festival so if you have a few hours spare before or over the week-end, do come and join in the fun. For further information contact Patrick Candler, Chairman, Bythams Music, 07876 806646.